AFRICANGLOBE – Ethiopia warned on Tuesday it would take necessary action against arch-rival Eritrea unless it refrains from an alleged destabilizing role in the volatile east African region. 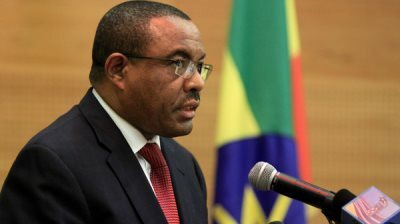 While addressing parliament, Ethiopian prime minister, Hailemariam Desalegn, accused the Eritrean government of continuing to engage in destabilizing peace and security of Ethiopia and the region at large. Addis Ababa has repeatedly accused Asmara of trying to destabilizing the horn of Africa’s nation by backing Ethiopian rebels and by providing direct and indirect support to al-Qaida allied Islamist militants in Somalia. However Eritrea’s subversive activities in the region are mainly targeting both directly or indirectly at Ethiopia. While responding to queries from MPs, Desalegn said although Ethiopia is ready for peace negotiations to restore ties and normalize relations with Eritrea, however he said “Asmara has shown no sign of interest for regional peaceful coexistence”. In 2009 the UN slapped Eritrea with sanctions over charges it armed and provided financial support to al Shabab. But, Asmara has denied the allegation and stresses there is no justification for imposing the sanctions. In a rare threat to take direct measures, the premier said that unless Eritrea changes its policy of destabilizing the East African region, “Ethiopia will then be forced to take an appropriate action to quell its destabilizing efforts”. The two neighbours have routinely traded tough rhetoric following a 1998-2000 border war which has killed an estimated 70,000 people. The Ethiopian leader said the regime in Asmara is using its destabilizing acts as a tool to divert the attention of the people from internal instability and to further maintain its grip on power. Every month around 5,000 Eritreans flee home to neighbouring countries mainly to Ethiopia and Sudan in protest to political repression at home. Currently Ethiopia hosts at least 90,000 Eritrean refugees. Recently the United Nations Commission of Inquiry on Human Rights in Eritrea has recently released its report where it unveiled the government’s gross human right violations. As a result the UN Human Rights Council extended for another year the mandate of the Special Rapporteur as well as Commission of Inquiry on Eritrea. It also decided to assign human right experts who will investigate human right violations including to alleged “crimes against humanity” committed by the Eritrean government. The UN body has also accused president Isaias Afeworki led-government of committing extra-judicial executions, torture, arbitrary and incommunicado detentions, enforced disappearances, sexual violence and other forms of right abuses by the regime. There are an estimated 5,000 to 10,000 political prisoners in Eritrea.